If you’re in the market for an Echo Dot, odds are you’ve read countless reviews; I know I did before I bought mine. And let me tell you what I learned: they don’t tell you what you need to know. Don’t get me wrong, the reviews do an excellent job of breaking down the basics, but most fail to explain what a Dot, and Alexa, can really do for you. More importantly, they tend to gloss over any shortcomings, giving you a less than clear picture of the devices overall worth. But I’m about to change all that. As the owner of 3 Dots, I know all the ins and outs of this ingenious device and will share what I’ve learned with you- the good and the bad. My Ultimate Echo Dot Review is unlike any other because I’ll not only tell you what it can do, I’ll tell you what it can’t, so you can see if it’s the device for you. 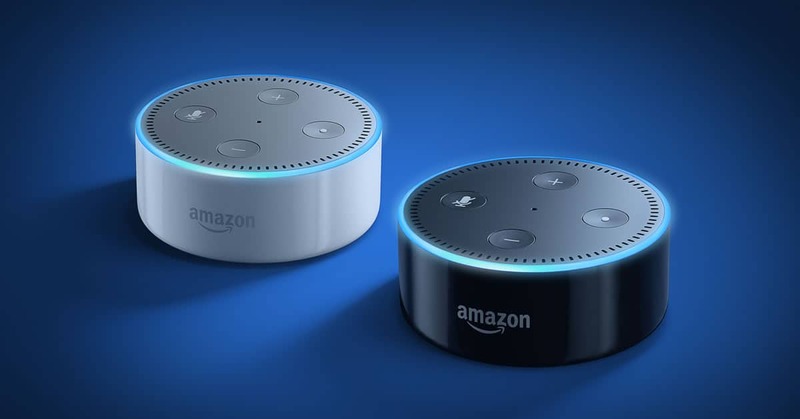 Bigger doesn’t always mean better, and Amazon’s Echo Dot is proof of that. 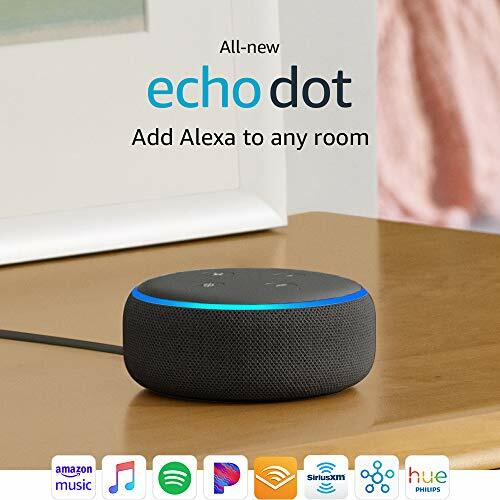 The Dot is the smallest of the Echo devices, yet it is the best value for your money, costing a third of the price. It can do everything the Echo can do, the only difference being it does not have as powerful a speaker. 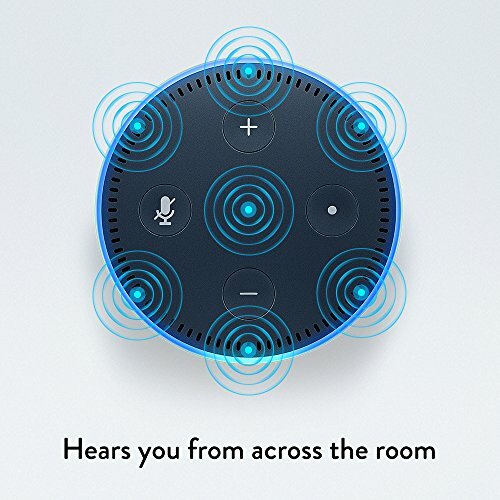 All that means for you is that if you have a party and want to use your Dot, you’ll need to hook it up to an external speaker; otherwise, it plays loud and clear if you just want to shimmy to some jams while you clean or relax with friends and listen to some classics. As for what it can do- we’ll get to that in a minute. First, I want to go over how it works and what it looks like so you have a clear picture in your mind. You can put it on your desk, countertops, shelves, or even mount it to a wall, so it blends in and is always within earshot. Available in black or white, there are also sleeves in various fabrics, like leather, if you want a more polished look. What I love though is the rotating ring on the top; it glows blue when you engage it and red when it’s muted. Oh, and there are volume buttons on top so you can easily adjust the unit. Set-up for the Dot is surprisingly simple; having read other reviews I was a bit intimidated and expected the process to be complicated, but luckily it was the opposite. Once you plug it in, go to the Alexa app, put in your preferences, location and other relevant data and you’re ready to go. Alexa can stream music, set alarms, and timers, tell jokes (although I must warn you they are kinda corny), recite recipes, let you know when your favorite show is on and more and more. Just say, Alexa, when is the next episode of Ray Donovan on? Or Alexa, play me a Justin Timberlake song and she’ll do it. And with a little more programming, you can use your Dot with smart devices, like the Samsung SmartThings hub or Nest Thermostat. Again, the process is simple. Using the Alexa app, you will name and group the device or appliance you want to command. And you can group items individually or in groups, for customized controls. For example, you can name your bedroom lamp as my light but also put it in the upstairs lighting group so you can put it on and off individually or with the other lighting. And some smart devices, like the Philips Hue lighting system, works with the Dot right out of the box- no programming required! Believe me, these steps take minutes and are more than worth it. You’ll know what I mean the first time you’re in bed and realize you left the hall light on and didn’t have to get up to close it. Stream music, news, and more: with or without an Amazon Prime account you can stream music, news, and sports, with a simple voice command. Those with Prime can use Amazon Music and Video, while those without (or Prime members who want to) can use services such as Pandora, Spotify, and iHeart Radio, among others. And as great as that is, what impressed me is that Alexa can play tunes based on your mood! Ask her to play something upbeat, or bluesy, and she’ll choose for you. And don’t worry, the more you use her, the better she gets to know you and will pick songs from your favorite artists. Order from almost any retailer: besides Amazon, the Dot has been partnered with over 11,000 3rd-party partners to bring you the latest goods and services. From Domino’s to Uber and Just Eat you can ask for a car or order a pepperoni pizza with a simple voice command. Prime members have the bonus of ordering anything that’s Prime eligible- which puts you in direct contact with just about everything. 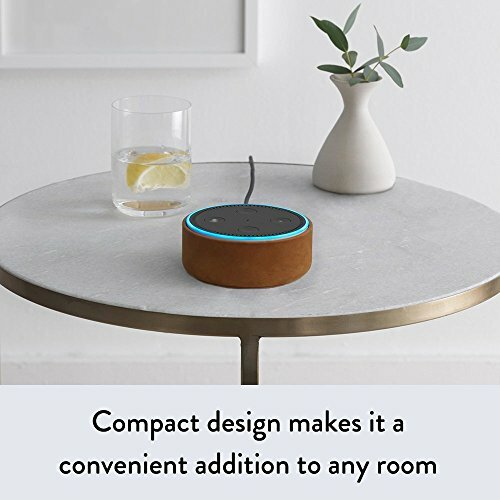 Control smart devices forget the remotes and smartphones because with the Echo you can turn up the lights, put on the TV or vacuum the floor. It is compatible with many smart device brands and products, including the Samsung SmartThings hub, Philip’s Hue bulbs, and the Nest thermostat. It’s your smart-home hub all-in-one. Just follow the set-up steps, ask Alexa to get your Roomba going, put your feet up and watch your appliance work for you. And Alexa also gives you information as she works. For instance, if you ask her when the new GOT episode is on, she will tell you the date and time, as well as what season and episode they are up to. Teach you and your family: if you struggle with math or need help whipping up a tasty dish once again, your Dot can come to the rescue. The fact that I can ask Alexa what is the square root of 72 (8.49) or 79 x 180 (14,220) makes math a lot less intimidating. I also like how she has expanded my cooking abilities ask her for a chicken , recipe and she’ll give you a variety to choose from, then walk you through the steps to create it. Your kids will be amazed at how smart and talented you are- no one has to know Alexa is “helping” you. 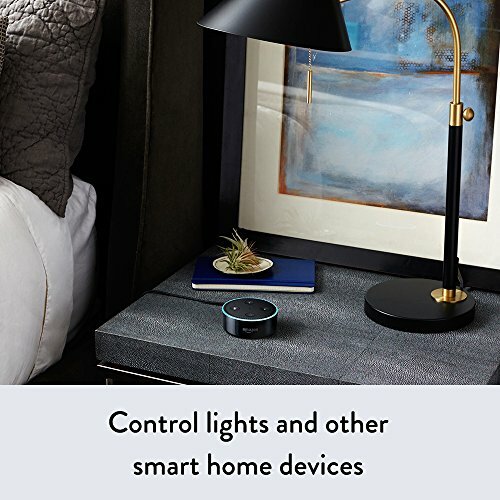 Call and message family and friends: Alexa can call or message anyone who has an Alexa-enabled device. Which means you can be up to your elbows in dough and still text your kids or call your hubby to remind him to pick up milk. What’s even more amazing is that you can access your Gmail or Google calendar with the Dot, something you can’t even do using The Dot’s rival, Google’s Home! Music and content may be limited: so far, I’ve only been told 1 song in unavailable, The Jackson 5’s ABC (my son’s pre-k graduation song). Oddly enough, Alexa will play any other song from them, so I’m assuming it’s a copyright issue. However, I did discover that some songs are not available if you don’t have Amazon Prime’s music package, which it turns out is a separate, additional charge from a standard Prime membership. It’s affordable at around $8 a month, but I’m a bit annoyed it is not automatically included with my Prime. And of course, you can also use a different music service, like Spotify. Calling apps “Skillz”: Dot’s 3rd party apps, like Uber and the Nest controls, are called “Skillz” and while the name is smart (technically these abilities are actual skills) it is annoying. I don’t need any more lingo, it confuses people and makes things seem harder than they are. It applies to all other Alexa devices too. You need to remember all your device names and groupings: I suggest you keep the names simple, as you need to say them each time you want to control an individual or group of items. It’s like having another 25 passwords to memorize, so short and sweet is the way to go. 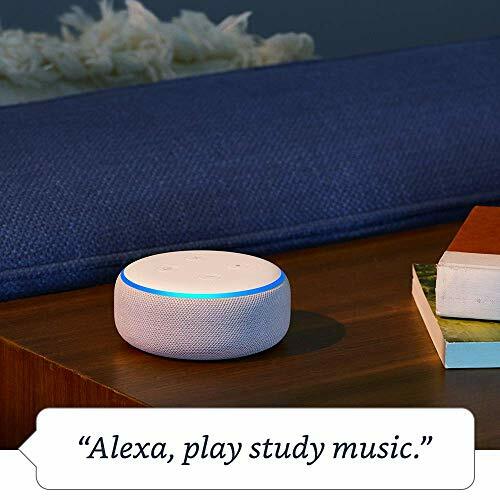 Single-User: Unlike the Google Home, the Dot can’t recognize multiple users and save their individual playlists, calendars, and other vital data. I’m sure that will change in the future, but until it does it is a bit of an inconvenience.